Dudhsagar Falls is one of a kind magnificent waterfalls situated on the borders of the states Karnataka and Goa. Plummeting from a height of 1017 feet, it is the fifth tallest cascade of India. The name Dudhsagar is derived from Konkani Language which means ‘milk sea’ because of the waterfall’s frothy white appearance and swift surge. The location is immensely popular for trekking activities, even though it is quite risky and tough a number of travelers indulge in the sport. If you are visiting Goa in the monsoon season, be sure to check out Dudhsagar Falls, the spectacular milky white waterfalls in South Goa.Travelers can take a passenger train from Madgoan in Goa or get at Castle Rock Station and board a train which frequently halts in the cascade’s vicinity. While traveling to this splendid location, travelers should note that there is almost no commercial businesses over here, so food and other necessary supplies should be carried by the travelers themselves. There are also a few overnight camping activities in the small, misty town of Castle Rock, a great opportunity for people to spend memorable time with friends. About 60 kms from Panaji, these falls are located in the Bhagwan Mahavir Wildlife Sanctuary at Collem, on the Goa-Karnataka border. Active travelers also consider trekking from Castle Rock to Dudhsagar, with the trek culminating at the falls. 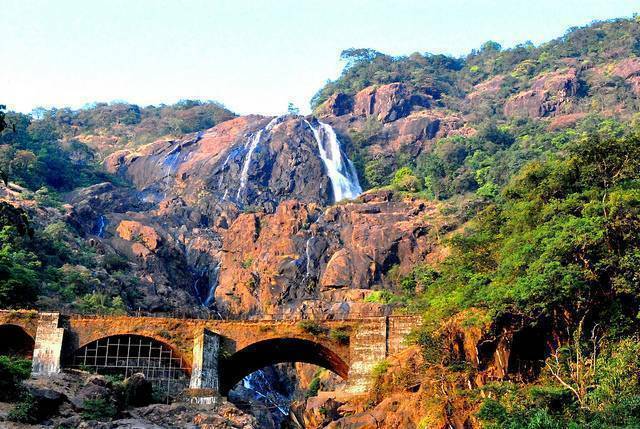 Dudhsagar Falls remain closed to public during monsoon months. You can visit the Dudhsagar falls by car but only till Kulem. From there you would need to either trek to the waterfalls or hire a local jeep. If you plan do the Dudhsagar Falls trek then make sure you are wearing good shoes. It would be 3-4 hours hike through rough terrain. You must carry enough water and some snacks. If rains are expected carry raincoats and be prepared for leeches as well. Best way is to carry some salt with you. A hypnotizing experience, Dudhsagar Falls is that brief weekend getaway to Mother Nature’s tranquil lap from the chaos of reality. If you are in Goa, then you can easily book a Dudhsagar private or a group tour from places such as Calangute, Baga, Candolim and other main North Goa locations. Dudhsagar Falls is about 550 kilometers from Bangalore and a great road trip destination along with Dandeli. There are few plantation stay options near Dudhsagar Falls as well. Which train crosses Dudhsagar Falls bridge? All trains plying between Margaon (MAO) to Londa (LD) go via Dudhsagar Falls. A forest rest-house run by the Karnataka Forest Department and is the main place of stay near these waterfalls. Roads are closed in the rainy season from June to September as roads get submerged in monsoon rain water. The roads reopen again in October. 4W drive vehicle (SUVs) should be preferred on this way. Ordinary cars are not suitable for the drive. Motorable track ends a KM before the Falls.